One of the foundational principles of the Web 2.0 philosophy that Tim O’Reilly stresses relates to “self-improving” systems that get better as more and more people use them. I try to keep a watchful eye out for business books on this subject – books about companies who know that data is their business; books like the somehow unsatisfying Competing on Analytics, and a new one I’m looking forward to reading: Data Driven: Profiting from Your Most Important Business Asset (if you’d like to buy it for me… OUseful.info wishlist;-). First of all, the “Clubcard customer contract”: more data means better segmentation, means more targeted/personalised services, means better profiling. In short, “the more you shop with us, the more benefit you will accrue” (p68). This is at the heart of it all – just like Google wants to understand it’s users better so that it can serve them with more relevant ads (better segmentation * higher likelihood of clickthru = more cash from the Google money machine), and Amazon seduces you with personal recommendations of things it thinks you might like to buy based on your purchase and browsing history, and the purchase history of other users like you, so Tesco Clubcard works in much the same way: it feeds a recommendation engine that mines and segments data from millions of people like you, in order to keep you engaged. Scale matters. In 1995, when Tesco Clubcard launched, dunhumby, the company that has managed the Clubcard from when it was still an idea to the present day, had to make do with the data processing capabilities that were available then, which meant that it was impossible to track every purchase, in every basket, from every shopper. (In addition, not everything could be tracked by the POS tills of the time – only “the customer ID, the total basket size and time the customer visited, and the amount spent in each department” (p102)). In the early days, this meant data had to be sampled before analysis, with insight from a statistically significant analysis of 10% of the shopping records being applied to the remaining 90%. Today, they can track everything. Working out what to track – first order “instantaneous” data (what did you buy on a particular trip, what time of day was the visit) or second order data (what did you buy this time you didn’t buy last time, how long has it been between visits) – was a major concern, as were indicators that could be used as KPIs in the extent to which Clubcard influenced customer loyalty. Value – how profitable is the customer to the store (if you only buy low margin goods, you aren’t necessarily very profitable), and how valuable is the store to the customer (do you buy your whole food shop there, or only a part of it?). Working out what data to analyse also had to fit in with the business goals – the analytics needed to be actionable (are you listening, Library folks?!;-). 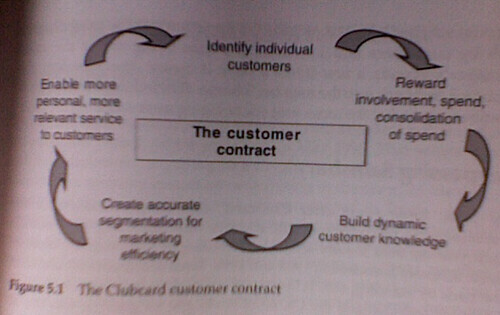 For example, as well as marketing to individuals, Clubcard data was to be used to optimise store inventory (p124). “The dream was to ensure that the entire product range on sale at each store accurately represented, in selection and proportion, what the customers who shopped there wanted to buy.” So another question that needed to be asked was how should data be presented “so that it answered a real business problem? If the data was ‘interesting’, that didn’t cut it. But adding more sales by doing something new – that did.” (p102). Here, the technique of putting data into “bins” meant that it could be aggregated and analysed more efficiently in bulk and without loss of insight. 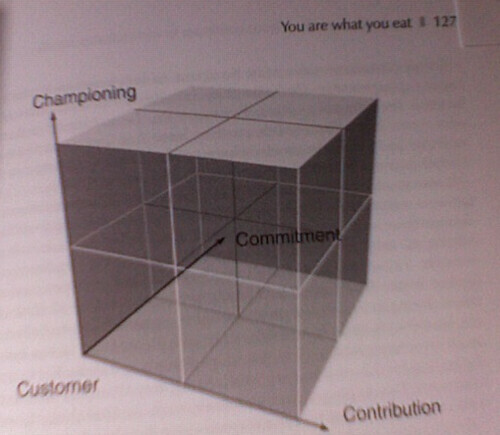 Returning to the customer focus, Tesco complemented the RFV analysis with the idea of “Loyalty Cube” within which each customer could be placed (pp126-9). By placing individuals in separate areas of this chart, you can tune your marketing to them, either by marketing items that fall squrely within that area, or if you’re feeling particularly aggressive, by trying to move them from through the differnt areas. As ever, it’s contextual relevancy that’s the key. But what sort of data is required to locate a customer within the loyalty cube? “The conclusion was that the difference between customers existed in each shopper’s trolley: the choices, the brqnds, the preferences, the priorities and the trade-offs in managing a grocery budget.” (p129). The shopping basket could tel a lot about two dimensions of the loyalty cube. Firstly, it could quantify contribution, simply by looking at the profit margins on the goods each customer chose. Second, by assessing the calories in a shopping basket, it could measure the headroom dimension. Just how much of a customer’s food needs does Tesco provide? “Products describe People” (p131): one way of categorising shoppers is to cluster them according to the things they buy, and identify relationships between the products that people buy (people who buy this, also tend to buy that). But the same product may have a different value to different people. (Thinking about this in terms of the OU Course Profiles app, I guess it’s like clustering people based on the similar courses they have chosen. And even there, different values apply. For example, I might dip into the OU web services course (T320) out of general interest, you might take it because it’s a key part of your professional development, and required for your next promotion). Clustering based on every product line (or SKU – stock keeping unit) is too highly dimensional to be interesting, so enter “The Bucket” (p132): “any significant combination of products that appeared from the make up of a customer’s regular shopping baskets. Each Bucket was defined initially by a ‘marker’, a high volume product that had a particular attribute. It might typify indulgence, or thrift, or indicate the tendency to buy in bulk. … [B]y picking clusters of products that might be bought for a shared reason, or from a shared taste” the large number of Buckets required for the marker approach could be reduced to just 80 Buckets using the clustered products approach. “Every time a key item [an item in one of the clusters that identifes a Bucket] was scanned [at the till],it would link that Clubcard member with an appropriate Bucket. The combination of which shoppers bought from which Buckets, and how many items in those Buckets they bought, gave the first insight into their shopping preferences” (p133). By applying cluster analysis to the Buckets (i.e. trying to see which Buckets go together) the next step was to identify user lifestyles (p134-5). 27 of them… Things like “Loyal Low Spenders”, “Can’t Stay Aways”, “Weekly Shoppers”, “Snacking and Lunch Box” and “High Spending Superstore Families”. Identifying people from the products they buy and clustering on that basis is one way of working. But how about defining products in terms of attributes, and then profiling people based on those attributes? In the end, 20 attributes were chosen for each product (p142). Clustering people based on the attributes of the products they buy produces segments defined by their Shopping Habits. For these segments to be at their most useful, each customer should slot neatly into a single segment, each segment needs to be large enough to be viable for it to be acted on, as well as being distinctive and meaningful. Single person segments are too small to be exploited cost effectively (pp148-9). calorie count – on the food side, calorie sellers are the competition. We all need so many calories a day to live. If you do a calorie count on the goods in someone’s shopping basket, and you have an idea of the size of the household, you can find out whether someone is shopping elsewhere (you’re not buying enough calories to keep everyone fed) and maybe guess when a copmetitor has stolen some of your business or when someone has left home. (If lots of shoppers from a store stop buying pizza, maybe a new pizza delivery service has started up. If a particular family’s basket takes a 15% drop in calories, maybe someone has left home)? PPS Here are a few more news stories about the Tesco Clubcard: Tesco’s success puts Clubcard firm on the map (The Sunday Times, Dec. 2004), Eyes in the till (FT, Nov 2006), and How Tesco is changing Britain (Economist, Aug. 2005) and Getting an edge (Irish Times, Oct 2007) which both require a login, so f**k off…). A little while ago, I posted some notes I’d made whilst reading “Scoring Points”, which looked at the way Tesco developed it’s ClubCard business and started using consumer data to improve a whole range of operational and marketing functions within the tesco operation (The Tesco Data Business (Notes on “Scoring Points”)). For anyone who’s interested, here are a few more things I managed to dig up Tesco’s data play, and their relationship with Dunnhumby, who operate the service. In the previous post, I mentioned how Tesco segment shoppers according to their “lifestyle profile”. This is generated by looking at the data generated by a shopper, in terms of what they buy, when they buy it, what stories you can tell about them as a result. So how well does Tesco know you, for example? (I assume Tesco knows Miss Jones drives to Tesco on a Saturday because she uses her Clubcard when topping up on fuel at the Tesco petrol station…). It’s quite interesting to see what other players in the area think is important, too. One way of doing this is to have a look around at who else is speaking at the trade events Giles Pavey turns up at. 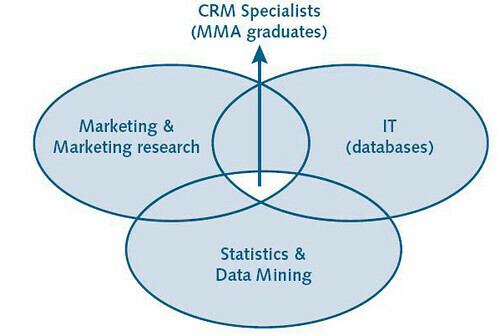 For example, earlier this year was a day of impressive looking talks at The Business Applications of Marketing Analytics. The course website also features an interview with three members of dunnhumby: Orlando Machado (Head of Insight Analysis), Martin Hayward (Director of Strategy) and Giles Pavey (head of Customer Insight) [view it here]. – Life as an “intern” at dunnhumby. 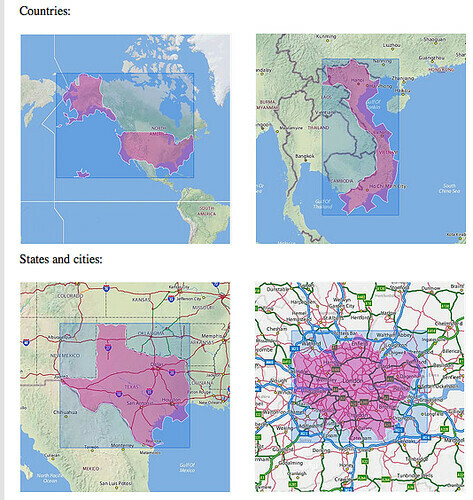 – Real Time Geodemographics – New Services and Business Opportunities from Analysing People in Time and Space: real-time? Maybe this ties in with things like behavioural analytics and localised mobile phone tracking in shopping centres? So what are “geodemographics: (or “geodems”, as they’re known in the trade;-)? No idea – but I’m guessing it’s the demographics of a particular locales? Tesco is working with Dunnhumby, the marketing group behind Tesco Clubcard, to integrate highly targeted third-party advertising across Tesco.com when the company’s new-look site launches next year. Jean-Pierre Van Lin, head of markets at Dunnhumby, explained to NMA that, once a Clubcard holder had logged in to the website, data from their previous spending could be used to select advertising of specific relevance to that user. Now I’m guessing that this will represent a change in the way the data has been used to date – so I wonder, have Tesco ClubCard Terms and Conditions changed recently? Looking at the global reach of dunnhumby, I wonder whether they’re building capacity for a global targeted ad service, via the back door? Does it matter, anyway, if profiling data from our offline shopping habits are reconciled with our online presence? 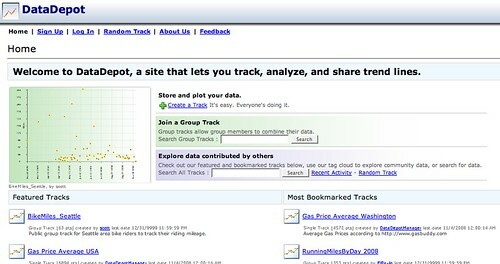 In “Diving for Data”, (Supermarket News, 00395803, 9/26/2005, Vol. 53, Issue 39), Lucia Moses reports that the Tesco Clucbcard in the UK “boasts 10 million households and captures 85% of weekly store sales”, along with 30% of UK food sales. The story in the US could soon be similar, where dunnhumby works with Kroger to analyse “6.5 million top shopper households”, (identified as the “slice of the total 42 million households that visit Kroger stores that drive more than 50% of sales”). With “Kroger claim[ing] that 40% of U.S. households hold one of its cards”, does dunnhumby’s “goal … to understand the customer better than anyone” rival Google in its potential for evil?! Steps Towards Making Augmented Reality a Reality? I’ve been a fan of the potential of augmented reality for some time (see Introducing Augmented Reality – Blending Real and Digital Worlds for some examples why…) but there have so far always been a couple of major stumbling blocks in the way of actually playing with this stuff. One has been the need to download and install the AR application itself; the other has been to get a hard copy, or print out, of the registration images that are used as the base for the digital overlay. So when I saw this demo of a browser based Flash Augmented Reality application (via TechCrunch), I realised that the application installation barrier could soon be about to crumble… (though there is still potentially a compute power issue – the image registration and tracking is computationally expensive, which means the Flash app is not yet as reliable as a compiled, downloaded application). The issue of having to print out the registration image still remains, however. [Cue sideways glance to camera, and TV presenter mode;-)] Or does it? So here then we have another way of using two media in sympathy with each other to enrich an act of communication (cf. Printing Out Online Course Materials With Embedded Movie Links and Dual View Media Channels). So it looks like a magic lens app for the iPhone might not be so far away? And if you or a friend has a second large screen smartphone (or ebook reader) to hand, you can use it as “magic paper” to render any required registration image or set of images, as shown above!;-). PS see also Wikitude (here), an Android app that will overlay a camera view with information about points of interest. 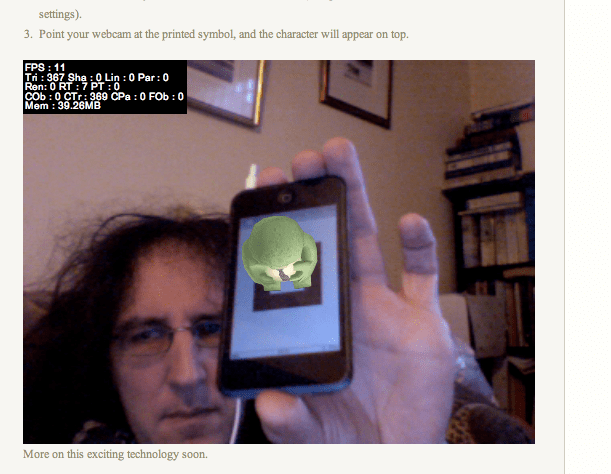 PS see also AR virtual pet game for iPhone. Author Tony HirstPosted on November 30, 2008 December 3, 2008 Categories Anything you wantTags augmented reality, iPhone2 Comments on Steps Towards Making Augmented Reality a Reality?